The Variables View tracks and displays the variables currently in use in the Editor and Console Views (either currently being debugged in the Editor or that has been executed in the Console). Clear Variables: Use the Workbench's Reset button to clear out the current variables in the Variables View. Highlight/Edit Variable: Single-click on a variable's value to highlight and edit. 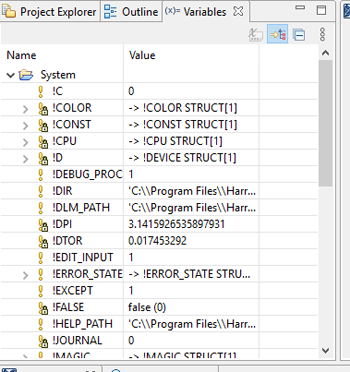 Drag-and-Drop variables to an editor or the IDL Console to paste the variable name. View Menu > Layout allows the change of the orientation of the Variables view. Select All - Select all active variables. Copy Variables - Copy selected variables. Delete Variables - Delete all selected variables. Rename Variable - Rename the selected variable. Change Value - Allows you to set a new value for the selected variable. Find - Allows you to search through your variables list for a specific string.